Swims & Sweeps is proud to be an Imagine Fiberglass Pool Builder, serving the greater Topeka area. An Imagine Pool is more than a swimming pool – it is a swimming pool of unique and sophisticated design, technology and technique. It is an unwavering dedication to quality and innovation. It’s the belief that happiness is best experienced with loved ones at your side, enjoying an Imagine Pool in your home. Learn more about Imagine Pools and the ways we strive as a company to provide you with the perfect accent to your very own backyard paradise with the newly-released company overview video. Subscribe to the Imagine Pools YouTube channel for more as we release it. Your fiberglass swimming pool comes direct from the Imagine Pools manufacturing facility, pre-made and ready to install. In fact, you can be swimming in as little as 4 days after council approval. Compare that to a concrete pool that can take months to complete and during that time your backyard looks a mess! Imagine Pools fiberglass swimming pools have a smooth clean gelcoat finish that is non-abrasive. There are no sharp edges or rough finishes. Compare that to some pebble pools that are so abrasive they can harm your skin. The gelcoat finish on an Imagine Pool not only looks great, its so easy to look after. The surface is smooth and non-porous so it cleans easily and is very stain resistant. No one likes swimming in a chemical cocktail but some pools require constant monitoring and expensive chemicals. 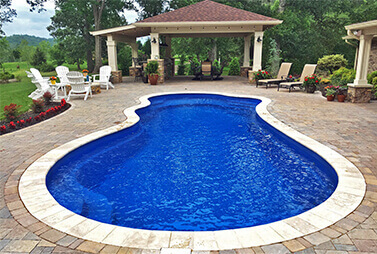 Not so with Imagine Pools fiberglass, the surface is chemically inert so there is nothing in the pool surface that can alter the water chemistry. Hence, very low chemical usage and considerable cost savings on running your pool. Imagine Pools fiberglass pools exceed the Australian Standards for shell thickness. The high tensile strength of fiberglass will allow the pool shell to flex without cracking to accommodate earth movement. No wonder airplane manufacturers are using fiberglass to build planes! Imagine Pools prides itself on being at the cutting edge of pool design technology. All of our swimming pool shapes are new designs and reflect today’s thinking and architectural trends. 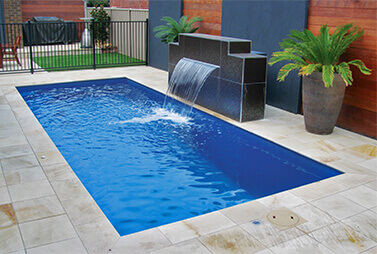 There will be a Imagine Pools design to ideally suit your home. Imagine Pools offers an exclusive range of seven beautiful colors, each with its own sparkle and shimmer finish, ensuring you will be able to find the perfect color to suit your home, taste and budget. Sometimes what we see in our minds doesn’t always translate to the pool builder. 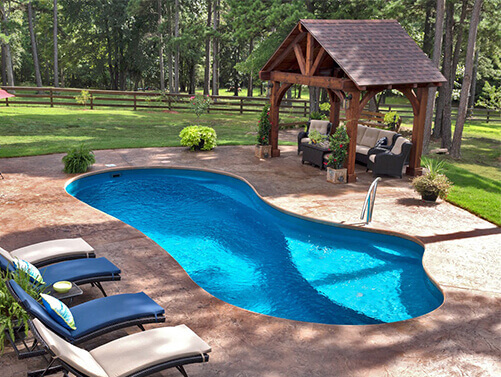 With Imagine Pools fiberglass swimming pools, what you see is what you get. The swimming pool shapes and sizes come off molds and cannot vary in anyway. Salt chlorinators, chlorine, fresh water systems, ozone systems all work wonderfully well with Imagine Pools fiberglass swimming pools. Whatever your choice may be it will be compatible.